This chapter reviews Vibrio cholerae strains of different serogroups circulating in Russia and CIS countries with special reference to their pathogenicity and molecular characteristics. Certain epidemics, outbreaks, and sporadic cases of cholera, which took place during the 6th and 7th pandemics, are described. 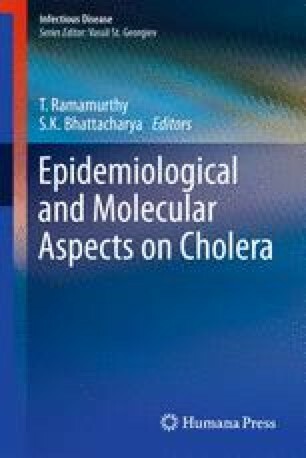 The data of epidemiological analysis as well as variable microbiological and molecular features of toxigenic and non-toxigenic strains isolated in different territories authenticated the imported nature of cholera manifestations. In the 21st century the spread of diseases caused by V. cholerae in Russia tends to decrease, but due to the high morbidity taking place in a number of Asian and African countries and migration of people the danger of cholera importations and spread still exists. The possibility of long-term preservation of the cholera agent in the environment and formation of stable or temporary endemic foci in climatic conditions of Russia and other CIS countries are discussed.